Many birds take advantage of the berries that form part of Nature's autumn bounty. Some of these berries may last through into the New Year, providing much-needed resources for wintering thrushes, but which berries are used and when? With the help of our survey volunteers we hoped to increase our understanding of how birds use garden berries and answer key questions to deliver better advice on which berry-producing plants to use in our gardens. The Birds and Garden Berries Study ran from the end of September 2012 through to the end of March 2013. The study had three components, the first of which looked at berry availability throughout the winter. 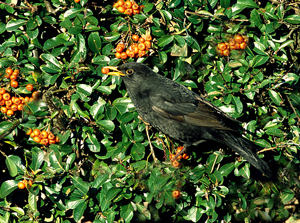 The second examined how quickly berries were removed from plants and the third looked at which birds took berries. Advice on selecting berry-producing plants for the garden can be found here and you can learn about how plants use birds to disperse their seeds by looking here. Find out more about berries and access a list of those eaten by birds here.